Click on the photos to enlarge! 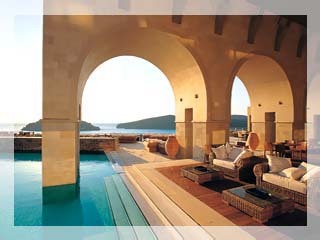 Welcome to the Mediterranean Retreat of Blue Palace, Resort & Spa at Elounda, Crete. A resort of exceptional quality and style set in mythical surroundings to sooth and inspire. Take pleasure in the dramatic views from your luxury bungalow, suite or villa; dive into the crystal clear blue waters of the Mediterranean; relax with a specialized treatment in our state-of-the-art The Elounda Spa & Thalassotherapy. And enjoy an impeccable service, which combined together with the celebrated Cretan hospitality, will make you feel right at home. Crete, the largest and southern most of the Greek islands is a land of astonishing diversity. A place where the three continents of Europe, Asia and Africa converge. A crossroads of civilization, each of which has left its unique mark on our island. It used to be the religious and economic center of the ancient civilized world. The landscape itself is a combination of snow-capped mountains contrasting with lush, flower-filled plains; unspoilt fishing villages sit side by side with the graceful Venetian towns of Chania and Rethymnon; and always the crystal clear blue waters of the Mediterranean are in sight with lovely beaches and bays. The climate is mild and dry, with often northerly wind, the "meltemi", that brings a cool breeze on warm summer days. If there is a reason to visit Blue Palace, Resort & Spa it must be its unparalleled location with breathtaking views. Blue Palace is situated just 3 km away from the village of Elounda and within a few hundred meters of the fishing village of Plaka, where life still moves along to the rhythm of another era. The resort overlooks the sparkling blue waters of the Mediterranean Sea and sits opposite the isle of Spinalonga with its medieval fortress. Spinalonga's story dates back to the Venetians and Turks, conquerors of Crete, and is nowadays a unique historical attraction protected by the Greek Society of Byzantine Antiquities. The natural beauty of the area is enhanced by the hotels stylish design and by its gardens built as attribute to the local vegetation. The resort unfolds in small units of bungalows that merge harmoniously with the serene and sensuous ambiance. Nestled on a small cliff, the resort leads down to a 200-meter long beach. A panoramic lift has been built to ensure effortless access to the beach from all levels of the hotel, while a number of electric cars are also available. The Aghios Nikolaos area, where the Blue Palace is situated, is on the north-east coast of the island, overlooking the beautiful gulf of Mirabello. The Hotel itself sits opposite the isle of Spinalonga with its medieval fortress founded in 1579 by the Venetian benefactor Luca Michiel. Aghios Nikolaos, 12 km from the Hotel, is an international and cosmopolitan charming town with its dramatic Voulismeni Lake connected to the sea and lined with cafes, taverns, fishing boats and caiques.